The Bistro brunch of the Sugar Land Wine & Food Affair changed up the status quo from the rest of a weekend celebrating wine by shifting the focus seamlessly from wine to food. From Wednesday to Saturday the wine and spirits were the momentum that pushed the event. Of course the food for the duration of these days was delicious and a great compliment to the extensive drink selection but it was clear on who was the superstar. For the final event of the Affair the festival spotlighted food during their brunch extravaganza. Brunch without question is one of my favorite meals of the day. I love savory foods but often crave some of the sweet treats that you can only find on your plate at breakfast. Brunch offers the best of both worlds as culinary creations can range from sweet to savory to salty all in perfect harmony. Additionally there is no better buffet offered that what comes with brunch. Because you choose what selections make up your plate combo you can nibble on smaller qualities but a much wider variety than most meals. 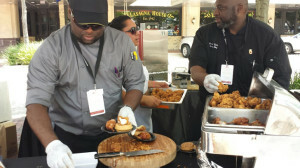 The Bistro Brunch hit the ground running by choosing the central location of Sugar Land Town Square to showcase some of the variety and creativity that can come from brunch. By offering food selections from paella to French toast and brunch drink staples like Bloody Mary’s and mimosas as well as a wide wine selection the Bistro Brunch covered all the basis of deliciousness. Although I had some really great surprise selections in favor from bagels to salad there was one clear stand out favorite in my book. 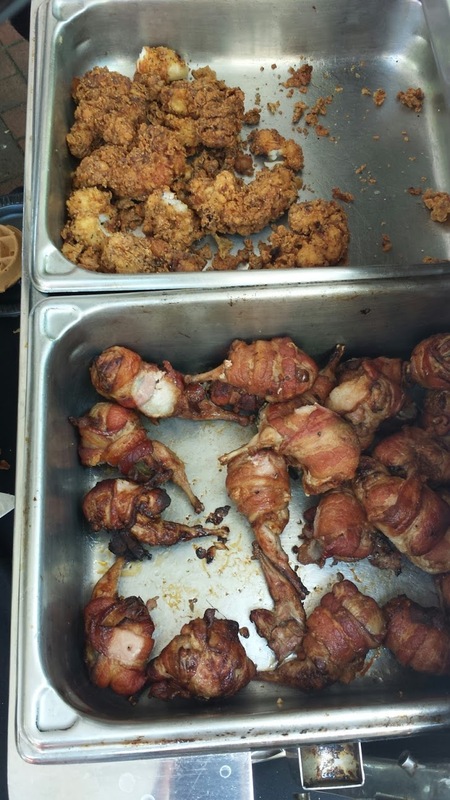 The masterminds over at the Burning Pear in Marriott Sugar Land Town Square cooked up a showstopper in their Fried Lobster and Waffles with honey butter and the bacon wrapped quail with jalapeno jam. As the Houston summer was on the rise it was a toasty out on Sunday, making waiting in line not my top priority. Nevertheless I decided to wait my turn and mockingly teased Chef Kourtenie Tyson when approaching the service that it better be worth the wait. At that Chef Tyson ensured I would quickly be in the midst of a foodgasm. Long story short…he was right. With stuffed quail wrapped in crispy bacon giving off a kick of spice in the jam and fried lobster that would make me gladly slap my momma the offering was a little slice of heaven on an early Sunday afternoon. 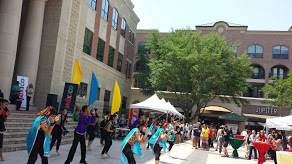 Top that off with a great band that makes you want to move your feet and a fun performance by NAACH Bollywood dancers the Sugar Land Wine & Food Affair left an impression that has me drooling in anticipation for next year’s fun.